Lonely Planet Compass Guides plus augmented reality – the perfect companion? The Lonely Planet travellers have been there, bought the T-shirt and found the best local food to spill on it. Their in-depth guides are crammed with directions and opinions; even on extra-thin paper, they're hefty volumes. It would be great if the new Lonely Planet Compass Guides could cram all of that into your Android phone with an AR view to act like a friend on tap. They're not there yet, but they get close. Each guide covers one city. We took the London and San Francisco guides out on the streets and looked up what to eat, what to see, where to shop, where to stay and a few handy extras designed to give you the flavour of the place. Lonely Planet told us which newspapers to trust, how much to tip and even found some of our favourite San Francisco cafes for hanging out in. It's the street savvy that sets these guides apart. Map View is a set of hand-picked results on Google Maps, although it never centres the map on where you are. Another black mark is that you can't download the guides to an SD card – at least not yet. The augmented reality view is a little buggy – like all AR tools at the moment – but it does enable you to point your phone across the street to find out what you're looking at and how to get to the nearest museum without overwhelming you with irrelevant hits. 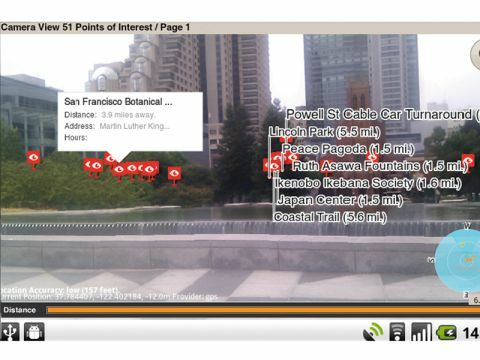 Perfect or not, it's better than Google Maps and Layar. The books give you even more information, of course, but you're more likely to pull your phone out of your pocket than open a book when you need some information on the fly.